Thank you July 4th Walkers! On Saturday, July 4th, we donned our tri-corner caps and took to the streets once again to declare independence from big money politics and demand the presidential candidates support systemic reform. Some 150 rebels signed up in advance to make the 20-mile trek from Rochester or 16-mile coastal walk from Hampton to downtown Portsmouth. After a festive BBQ, we celebrated our first Rally for Independence in Prescott Park with a bipartisan reading of the Declaration of Independence, "heroes of democracy" street theater, remarks by NH Rebellion founder Lawrence Lessig, live music, and plenty of free Ben & Jerry's! Although the weather and family conflicts dampened attendance, over 200 patriots in all braved the rain and gave up their holiday to join our Declaration. The media took note. In a clear sign that our movement is gaining steam in the mainstream press, dozens of outlets including the statewide WMUR and NHPR, and progressive and conservative radio and newspapers alike from The Boston Globe and Portsmouth Herald to The Union Leader and Washington Times covered the event. Our team and supporters also launched an energetic opinion and social media campaign with a dozen or more pieces printed in the run-up to July 4th and thousands of first-time contacts via social media. Although many news stories were brief, we are actively expanding our relationships with key state and national reporters, especially around our campaign to Ask the Question of every presidential candidate and hold them accountable. Walks don't plan themselves and I'm very grateful to our lead organizer Ellen and the entire staff, summer fellows, and many volunteers for their diligent work. Thanks also to Betty Tamposi on the Advisory Board and former state senator Burt Cohen for their impassioned reading of the Declaration. And we were backed by gracious in-kind sponsors including Ben & Jerry's, the Dover Friends Meeting, Panera Bread, etc. Up next: Revive Democracy Weekend on July 17-19, featuring our second annual Granny D Memorial walk from Dublin to Peterborough as well as a film screening and community celebration in Peterborough, house party on Dublin Lake, and Monadnock Summer Lyceum at the Peterborough Unitarian Church. After the signing of the Declaration of Independence in 1776, prints were made, couriers dispatched, and the Declaration read in towns throughout the colonies, including Portsmouth. Although the first ice cream ad would not appear for another year, we have it on good authority that George Washington and Thomas Jefferson partook in this fine delicacy even as they fought to secure our nation's independence. Needless to say, this Saturday July 4th we will help our selves to both! Please join our Rally for Independence at 4:30pm in Portsmouth's Prescott Park for a bipartisan reading of the Declaration of Independence, an appearance by some of our founding fathers and mothers, remarks by Lawrence Lessig, and, of course, free Ben & Jerry's ice cream! The Rally will celebrate the latest NH Rebellion "Walk for Independence" from big money politics, with two groups of rebels setting out on Saturday morning from Rochester and Hampton, NH, and arriving together in Portsmouth for a free BBQ and Rally. There's still time to sign up for the walks - just click here! What if I told you that there is a clear and simple way to transform the dysfunctional politics of Washington D.C.? And what if I told you there is an easy — and fun and productive — way to help make a difference this July 4th? If you are anything like me, you are fed up with D.C. failing to act on important issues — or worse, passing bills that increase the size of government, handing out favors to donors and special interests, and bickering about partisan issues instead of solving the real problems that lay ahead. This is not a partisan problem and, despite what you might hear, neither party can claim the moral high ground on the issue of systemic corruption. The main cause of the systemic corruption and dysfunction is the way candidates are forced to spend the majority of their time begging for campaign contributions. Bribery is illegal, and yet this almost-but-not-quite bribery is completely legal. It is corruption: pure and simple corruption, and the result is the same: a broken Congress exhibiting a profound lack of progress on every issue. By corruption, we do not mean quid-pro-quo corruption. Instead, we are talking about a corruption of an entire system… one that every politician is trapped within and seems content within. It is skewing the priorities, warping incentives, and leading to dysfunction which re-enforces itself every time a member of Congress, or the President, is forced to choose between doing what is best for re-election instead of what is best for the public. The “tragedy” is that most of us are resigned to things being this way. There is a prevailing belief that there is nothing we can do to change this system, however degrading it is to politicians, to voters, and to our country as a whole. And because we feel the system is hopeless, we give up. This is precisely what the two parties want us to do. The two-party structure and the massive industry that follows (lobbyists, pundits, talking heads, media, political “consultants,” and many others) are the only winners. By now you may have heard of the New Hampshire Rebellion, but in case you are not familiar, here is our goal: We are going to make the issue of systemic corruption driven by the way campaigns are funded the number one, cannot-ignore-it, issue in the high-stakes 2016 New Hampshire Presidential Primary. No matter what issue you think needs to be tackled in this country, it cannot be resolved without first solving corruption. The Left will not get environmental protection or real healthcare reform. The Right will not get a simpler tax system, reduced regulation, or a smaller, less intrusive government. And the majority of us in the pragmatic middle won’t see an end to the partisan and petty arguments of the two-party system. Whatever it is you want changed — whatever vision you have of a better America — corruption, in the way that Congress raises money, is standing directly in the way. We do not own a cable news network or series of talk radio stations, we do not have armies of lawyers, lobbyists, and lackies to do our bidding. What we do have is YOU – the citizens who make up 96 percent of the public who agree that our current political system is corrupt and dysfunctional and must change. Our next big push toward making the issue of corruption the deciding factor in who gets elected in 2016 is this July 4th, when we are going to walk two routes along the Seacoast. The more who walk with us, the clearer it becomes that this issue matters to NH voters. Those who can not do the walk can join the celebration at the end in Prescott Park. We want you to join us. Two groups will leave in the morning from Hampton and Rochester, and meet up at Prescott Park in Portsmouth in the afternoon for a rally. You can sign up at walk.nhrebellion.org. Last year, over 500 of you joined us on our 16-mile Independence Day walk from Hampton Beach to Fort Constitution in New Castle. This July 4th, we're upping the ante with two simultaneous '2016' themed walks – 20 miles from Rochester and 16 miles from Hampton – converging in downtown Portsmouth with a rousing call to make systemic corruption of money in politics the core issue of the New Hampshire Presidential Primary. You will not want to miss the finale event in Prescott Park, complete with barbecue, ice cream, and games! Will you join us this July 4th? In addition to July 4th, we are continuing to Walk the Talk on the streets and in our neighborhoods throughout the coming months to unite the vast majority of Granite Staters who care first and foremost about a government free of corruption. Please pick a route and register for July 4th today! P.S. There's still time to register for our Memorial Day weekend walk this Saturday from Lebanon to Hanover! And you can now set-up your own walk, no matter where you live, using our new Walk the Talk platform and toolkit! We are only three days away from the exciting Upper Valley Walk for Democracy! The weather report says 67 degrees and sunny, so it'll be a great day to walk for democracy. Please do register to join us. I also want to let you know about our sign-making party on Friday night from 5-7PM. We'll be in Collis Hall, Room 219, on Dartmouth's campus. It'll be a great opportunity to get to know some fellow walkers, and to make sure you're getting your message across in your own voice. Make sure also to share our facebook event for the walk, and to invite your friends. Looking forward to seeing you Saturday! We wanted to let our supporters in the Seattle area know that Lawrence Lessig will be speaking in Seattle on Thursday, June 4th, at the Town Hall Seattle venue, alongside bestselling author Marianne Williamson. If you can make it, you’ll be able to hear directly from both Lessig and Williamson at the event and afterwards at an informal reception. Tickets are $15 for the movie and reception, and every dollar of those funds will be used to support the work of the New Hampshire Rebellion to reduce the corrupting influence of money in American politics. Tickets can be purchased at the door for $20. Please note, this event is expected to sell out so please be sure to purchase a ticket online in order to secure a seat. Here is a direct link to the event on the Town Hall Seattle venue site, and here is the Facebook event. 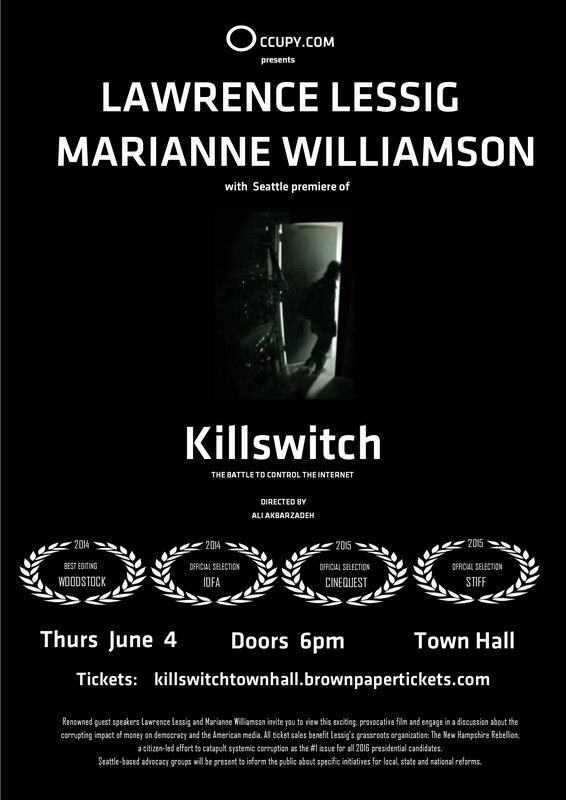 This event will also feature the Seattle premiere of "Killswitch: The Battle to Control the Internet" which covers some of the current work of the New Hampshire Rebellion. It seems like every day brings news of another presidential candidate setting up a Super PACs, raising millions of dollars, and then getting into the race. One leading contender plans to raise $2,500,000,000 – double the previous spending record – while another has decided to effectively outsource his entire campaign to keep on collecting unlimited contributions. Not a pretty picture. In response, we have an announcement of our own. It may not involve as many zeros but we think it’s worth sharing just the same. For the past few months, our team has been hard at work on a pair of exciting innovations to help us multiply our walks and our candidate questioning during the presidential primary. Now, we're rolling them out to you below and in our first Telephone Town Hall with NHR founder Lawrence Lessig at 4pm! Did you know that NH Rebellion supporters hail from 41 states? Or that supporters in more than half of states have either walked with us in New Hampshire or walked in solidarity from afar? Considering the breadth of our movement and the fact that our first two walks of 2015 garnered hundreds of press hits reaching millions of fellow citizens, imagine how much potential there is to grow the movement between now and Election Day 2016? That’s where you and our new Walk the Talk Platform and Toolkit come in! The first thing you’ll notice is the slew of upcoming walks already planned in the Granite State over the next few months – including our epic 20+16 mile Independence Day walk on July 4th. We hope you’ll sign up right away and encourage your friends to the do the same! But that’s not all: we want you to consider organizing a walk (or hike!) of your own this summer or fall, with support and materials from us. It can be as simple as gathering a few friends to make signs and walk with you in a July 4th parade, which we’ll advertise on the site. Whatever you have in mind, please drop us a line and we’ll be glad to help. We can’t build this movement without you. Our brand-new Questionr tool makes it easy to locate presidential candidates, ask them the Question, and track their responses via video upload. By deploying volunteers to every candidate event and crowd-sourcing their solutions (or lack thereof) to systemic corruption, we will elevate the debate and help ensure the next president is committed to reform on day one. It’s grassroots organizing and publicity — with a helping hand from technology. Now all we need is you! We'd love to hear your feedback, questions, and ideas as we road-test these new tools and work out any remaining kinks – please be in touch!